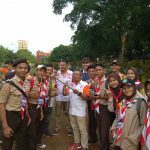 Jamboree On The Air 2017 was over and Scouts of South Jakarta were surprisingly joined this remarkable event with more than 500 scouts participants. Since 2010, we were helping to organize the JOTA station of South Jakarta and in fact this year is absolutely amazing. JOTA Station YC0ZSDA was luckily visited by an Avid DXer and World Cyclist Traveller, OZ1AA Thomas. He was visiting YB Land for two months and met his best friend YCØOST. 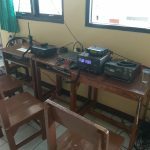 Formerly we had coordinating with Kwartir Cabang Pramuka Jakarta Selatan or Scouts of South Jakarta to organize the coaching and workshop related to Amateur Radio and Operating Procedure of Radio Communication several weeks before JOTA. Pre JOTA Coaching and Workshop at The City Major Office of South Jakarta. 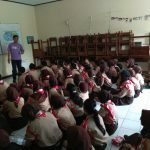 Thankfully it was happened with a cooperation between Scouts, ORARI of South Jakarta and The City of South Jakarta Major Office (Kantor Walikota Jakarta Selatan). At least 80 scouts was attending the coaching and workshop. It was a first time ever happened in a history of JOTA in South Jakarta. YD0PJX Bani, he was an assistant of JOTA Station Manager YC0ZSDA and also handling as a Junior Instructor. He was a JOTA Scouts and became a ORARI member years ago. A week later, the D-Day, ORARI Lokal Jakarta Selatan (ORARI of South Jakarta) built and organize four JOTA stations. First at Kwarcab JOTA station of YB0ZSD as a Main Hub station, the others are YC0ZSDA JOTA Kwartir Ranting Kebayoran Lama (MAN 4 School), YC0ZSDB JOTA Kwartir Ranting Cilandak (CSJS), and YC0ZSDC Kwartir Ranting Tebet (SMA 37 School). 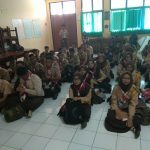 Senior high school Scouts came from all over of South Jakarta, even from Bodetabek area (Bogor, Bekasi, Tangerang etc). 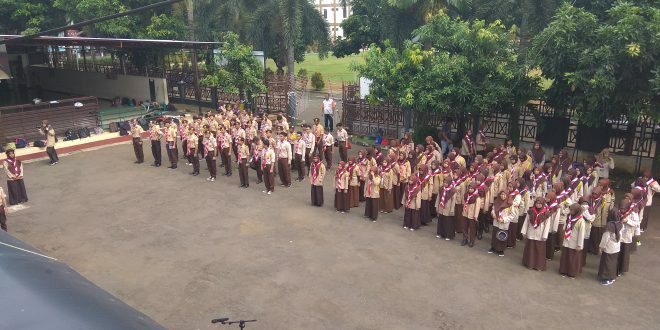 Totally more than 500 Scouts gathered in South Jakarta JOTA stations, separated by four stations and it was an amazing achievement for our JOTA organization this year. 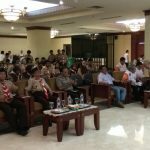 Of course, it will not happen without a solid and nice cooperation between three institutions : ORARI, Pramuka Kwartir Cabang Jakarta Selatan (Scouts of South Jakarta) and The City Major Office of South Jakarta. Our great appreciation and a big thank for ORARI South Jakarta HQ, ORARI Daerah DKI Jakarta, Pramuka Kwartir Cabang Jakarta Selatan (Scouts of South Jakarta), and Kantor Walikota Jakarta Selatan (The City Major Office of South Jakarta) for an excellent and astonishing teamwork in this glorious event. South Jakarta JOTA Instructor have been rewarded after finishing their duty from South Jakarta JOTA Coordinator 2017, YC0VYG (far right). Two of YBDXC member was involved in JOTA 2017 at South Jakarta, YDØSDD Ridwan Saleh as an Instructor for Digital Mode and YCØOST Irsan as a JOTA Station Manager of YC0ZSDA. We also gave a big applause and apreciation for any ORARI friends, especially YBDXC members around Indonesia were so active and involved in their local JOTA stations. Hopefully we always stands side by side with young Scouts for our next amateur radio generation.